September slips into the last warm days of summer, and October begins the cooler golden days of fall. These cooler morning temperatures allow more pleasant time outside and make me reconsider my gardening problems of this past growing season. I have to confess that rotating my vegetables from my usual small sunny area was somewhat of a disaster. Brown stalks with shriveled miniature fruit indicate that the tall Knock Out roses eventually smothered the tomato plants. A new herb/vegetable/flower bed created in the sunny early spring suffered as a nearby crepe myrtle offered unanticipated shade. To compensate, peppers and basil bent unproductively and unattractively toward the sun. The winter squash covered other plants as its vines chased the afternoon’s light. Needless to say, my attempt at growing edibles amid flowers was not as successful as I had hoped. 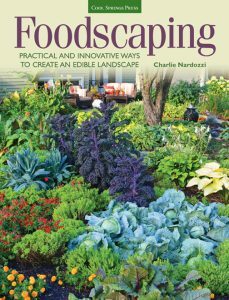 Foodscaping (Cool Springs Press, 2015) by Charlie Nardozzi is a book that I should have read before trying to grow food items in a predominately ornamental garden. In addition to being a Vermont media garden host, he offers a wide range of gardening suggestions in a bi-monthly newsletter included in his website, www.gardeningwithcharlie.com. Nardozzi writes that Foodscaping’s goal is to guide gardeners to include edible plants through a “touch up” rather than a “make over” process. In the first chapter, he emphasizes planting what you most like to eat in the spaces available. He then explains the various ways from hedgerows to containers in which edible plants can be used and grown. The landscaping principles introduced by Nardozzi in his second chapter are applicable to all gardeners, not just those wanting to plant edibles. Explanations of proportion, balance, focal points and color in landscape design are clear. He lists edible plants that are good substitutes for common landscape plants, ones with seasonal and leaf colors, and dwarf varieties best suited for containers. Especially helpful to new gardeners, he provides a checklist of characteristics to consider when contemplating replacing one plant with another, including hardiness zone, soil pH and light needs. Forty of his favorite edible-producing annuals, perennials, vines, trees, bushes, and herbs are recommended with detailed cultivation instructions in the book’s third chapter. Nardozzi concludes with a chapter explaining at an elementary level how to “plant, grow and harvest” vegetation.